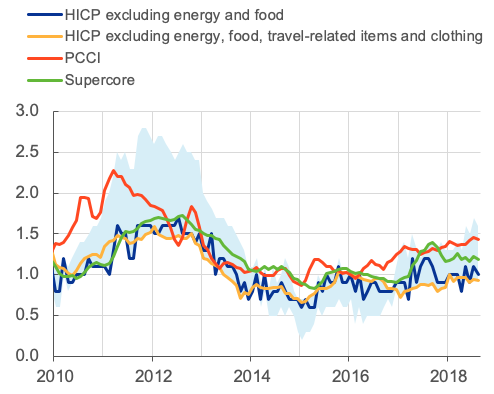 the ECB generally monitors a range of measures of underlying inflation to help distinguish noise from signal in headline inflation. The PCCI corresponds to a dynamic factor model based on the full 93 HICP items from each of 12 countries. 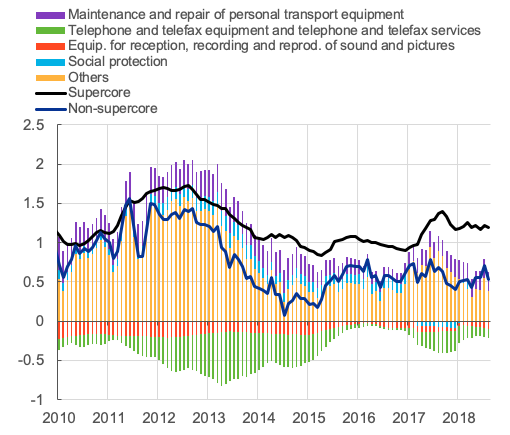 Supercore is based only on those items in HICP excluding energy and food that are sensitive to slack as measured by the output gap. The light blue range includes exclusion-based measures, trimmed means and a weighted median. Volatility is measured by the coefficient of variation, which scales the standard deviation by the mean of the series. Persistence is measured as the sum of the autoregressive coefficients where the optimal lags are chosen according to the Schwarz information criterion. The results shown are based on year-on-year rates. Seasonally adjusted month-on-month rates were also examined and the persistence values were generally lower and the ordering of the items was broadly unchanged. The estimation sample covers the period from January 2000 to April 2018. The bubbles are adjusted according to the corresponding HICP weights. The vertical and horizontal lines represent the averages for persistence and volatility, respectively, based on the full 93 items. 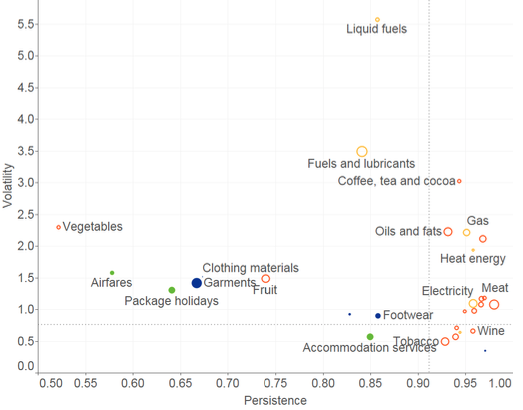 Items are coloured according to the following grouping: orange refers to food, yellow to energy, green to travel-related items and blue to clothing and footwear. The borders of the shaded areas define the largest and smallest annual rates of change used in the calculation of the respective trimmed means. 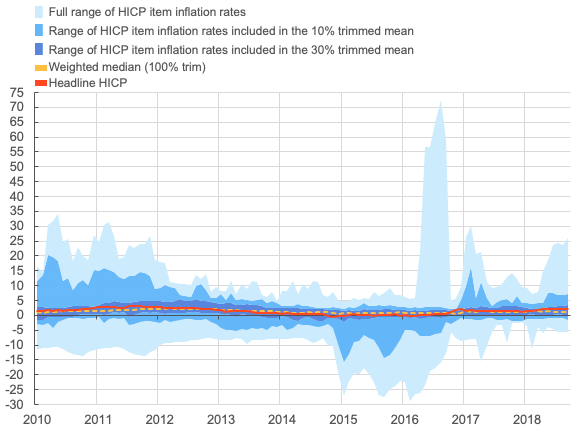 The trimmed means are compiled on the basis of year-on-year rates of change of the ECOICOP-4 sub-indices of the HICP. These rates of change are ordered by size and the respective weights are cumulated according to this order. The bottom x/2% and the top x/2% of the cumulative distribution are identified, where x takes a value of 10, 30 or 100. In order to achieve a trimming of exactly x%, the weights can be adjusted for those sub-indices falling on the bottom and top x/2% thresholds. The trimmed mean is then calculated as a rescaled weighted average of the year-on-year rates of change of the remaining items where the weights of the respective year are used. Image: Eurostat and ECB calculations. 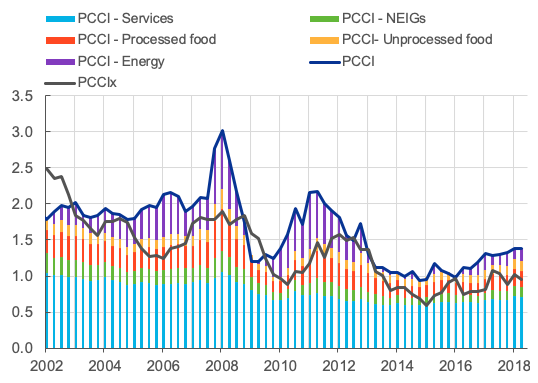 What’s happening to EU inflation outside of the Eurozone? The PCCIx is based only on items in HICP excluding energy and food.